The show lasts approximately 75-80 minutes. The show price also includes dinner and unlimited Pepsi products. Arabian Nights Dinner Attraction has closed and is no longer open. 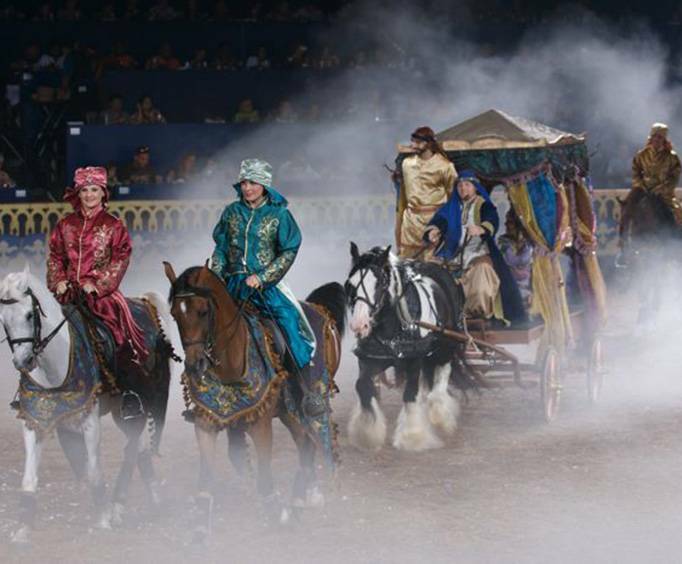 Beautiful horses, dazzling costumes, heart-stopping acrobatics, and a fabulous three-course meal are only the beginning of an unforgettable night of entertainment at Arabian Nights Dinner Attraction, telling the story of the Royal Celebration! This activity is an amazing addition for packages for Orlando FL. The Royal Celebration presents a tale of intrigue, magic, and love, guaranteed to delight audiences of all ages. It is the wedding day of the lovely Princess Amirah of the Saglawi tribe and the brave Prince Raswan of the Ruala tribe, who together represent the most powerful kingdoms in the Bedouin Empire. In a night of remarkable performances and daring feats, you are invited to join in the celebration of the royal wedding, to watch true love bring two hearts together and witness the beauty of the Arabian horses! 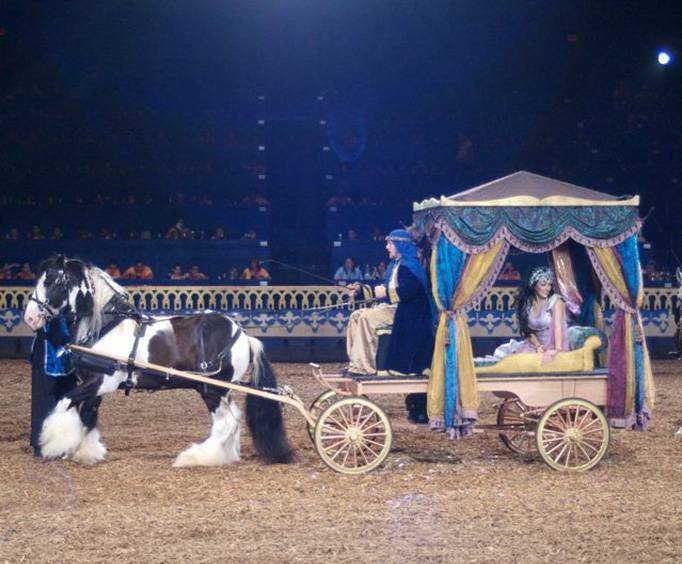 The royal wedding will feature a dinner theater experience of magic, performances, and romance unlike any that has been seen in the Bedouin Empire to date, so enjoy the delicious food and awe-inspiring, acrobatic horse-riding techniques! Watch performers in awe during this royal wedding display daring and skill with incredible acrobatics and intricate riding. Enjoy the famed chariot race, a sport as old as the original Olympic games that requires amazing coordination between the rider and his horses. Experience the displays of acrobatics by the ambulant Gypsies, and watch as riders perform incredible acrobatics on horseback, even soaring through the air to great heights. Let the most powerful magic and spectacular spells of the great Genie and the mysterious Sorcerer take you to the corners of the earth to deliver spectacles of wonder on horseback, and see the grace, beauty, and natural magical abilities of the amazing Black Stallion and the Unicorns, the last of their kind and one of the primary attractions of the Celebration. Endowed with unmatched magical powers, the Black Stallion serves Prince Raswan alone, recognizing him as the most skilled horseman in all the Bedouin kingdoms, and together, they exhibit unparalleled skill in their enchanting performance! The bold, handsome Prince Raswan of the Ruala tribe is renowned as the most skilled horseman in the Bedouin kingdoms, and he offers his bride grand gifts of magical wonder and will perform extraordinary feats on horseback alongside his dedicated entourage! The beautiful Princess Amirah of the Saglawi tribe is the young bride on her splendid wedding day! Lovable and passionate, the princess is sure to be in for the Arabian night of her life as she receives remarkable wedding gifts, watches brilliant international demonstrations performed in her honor, and of course is wed to her charming love! Be sure to add it onto your awesome Orlando getaway! *Child's meal comes with Chicken Tenders and Macaroni and Cheese. My husband and i were delighted in seeing such a magical romantic wedding story of the prince and princess on horseback. The inspiration of love and triumph while eating a delicious prime rib dinner is beyond words. You will also see 60 beautiful horses from around the world performing. It is a must see attraction. We are planning to return next year. We have been to arabian nights 4 times and we love it. My two granddaughter were included in the show. We are planning to go back again this june with some of our other grandchildren. Arabian nights is a great dinner show, had a good time. Enjoyed dinner and the show. For dinner you had good choices. Would recommend and do again!